Sudan, the world's last male northern white rhino, has been euthanized in a Kenyan conservatory after he was unable to recover from an infected leg. Could Sudan's death mean inevitable extinction of the species after decades of rampant poaching? Berlin zoologists have succeeded in producing living rhinoceros embryos from stored sperm of the northern white rhinoceros. The breakthrough nourishes hope of bringing the nearly extinct species back to life. The world's last male northern white rhino, named Sudan, has died in Kenya. His death means that only two females from the subspecies survive. The rhino, which would have been too old to breed, had to be euthanized. With cutting-edge reproductive technology offering hope for the "functionally extinct" northern white rhino, can resurrection science right past wrongs — or is it a distraction from protecting the animals we have left? 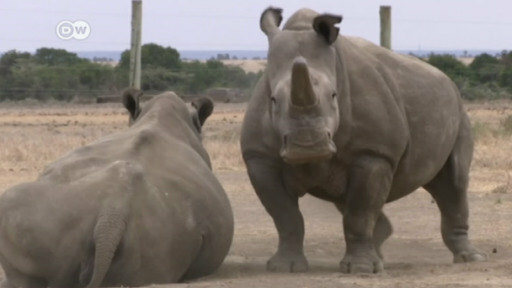 Sudan and his two female companions, Fatu and Najin, are the world's last three northern white rhinos. A group of vets are using advanced IVF techniques to save the subspecies.